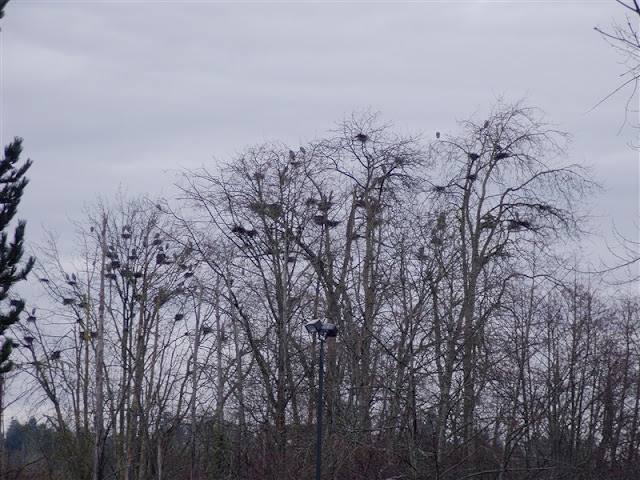 I had been keeping an eye out for the Great Blue Heron to make their annual return to their nesting trees next to the Kenmore Park and Ride, knowing that it is the time of year that they start showing up. On January 28th I glanced over when driving down 73rd and noticed one single heron perched there. Walking through the P&R on January 31st I was disappointed to see only empty trees. But then, seemingly out of nowhere, a flock of about 20 heron flew in and landed in the trees. Perfect timing! Perhaps they now have some eggs in the nests and are sticking around to guard them? More photos to come soon of what's going on around Little Swamp Creek as we transition to spring, including pictures of our neighborhood Red-tailed hawk who has also returned.